Purple cauliflower is the star of the show in this vibrant salad! Blanch it first to set the color, toss with dried cranberries or raisins for a bit of sweetness, then drizzle on some golden dressing and watch the magic happen with the acidity of the lemon juice interacts with the antioxidant compounds in the colored cauliflower. This salad isn’t just a pretty sight, it’s also a winner in its nutrient content. First, consider the colored cauliflower. It gets its purple hue from the presence of the antioxidant anthocyanin, which is also found in red cabbage and red wine. Cauliflower of all colors is also a reliable source of vitamin C, folate, and dietary fiber. According to specialty produce suppliers, purple cauliflower’s flavor is milder, sweeter, nuttier and free of the bitterness sometimes found in white cauliflower and is a heritage variety that comes from either Italy or South Africa… and not from a food scientist’s lab as you might have expected! To ramp up the nutritional value and to create a beautiful thick dressing, I turned to my old favorite trick of using a squeeze of anchovy paste to emulsify the olive oil and lemon juice. Make sure you check the ingredient label of any anchovy paste you buy and make sure it only includes AIP-compliant ingredients. This is the brand that I have in my refrigerator right now. Dried cranberries also add both flavor and more vitamin C, manganese, and more antioxidant phytonutrient content. But again, you need to check your ingredient labels carefully because most brands add sugar and processing oils. This brand is one of a very small number that is unsweetened and AIP-compliant. If you can’t find dried cranberries to meet your needs, feel free to use raisins or any other dried fruit instead. Finally, a hearty portion of dried turmeric adds a golden color and some anti-inflammatory boost to the dish, as well as a subtle spiciness. Always be careful when purchasing spices to make sure the company employs proper gluten cross-contamination prevention techniques. 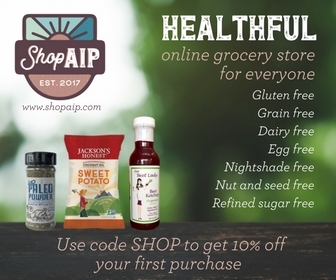 Here is a brand that I trust and has also been vetted by ShopAIP. Purple cauliflower and a few other secret ingredients combine to make a show-stopping beautiful dish that is also incredibly nutrient dense. Cut cauliflower head into bite sized florets. Place a steamer basket inside a large pot. Place water in the bottom of the pot and bring to a boil. When water is boiling, add cauliflower to steamer basket and cover. Allow to steam blanch for 6 minutes. Meanwhile, fill a large bowl or other container with ice water. When blanching is complete, drain the cauliflower and immediately place in ice water to quickly stop the cooking. Prepare the salad dressing by combining lemon juice, olive oil, anchovy paste, salt, and turmeric in a glass jar with a tight fitting lid. Shake vigorously and set aside. Drain cauliflower and transfer to large serving bowl. Add dried cranberries and gently toss to distribute. Drizzle dressing over cauliflower and cranberries mixture and then top with fresh cilantro. Serve immediately. Leftovers may be kept in refrigerator for up to 3 days.